Ranau Backpackers Hostel is a family-run hostel with a uniquely home away from home atmosphere. 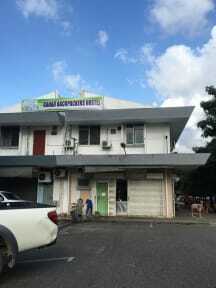 Located right in the heart of Ranau and housed within a 2-storey corner shoplot, are within a few minutes' walk to supermarket, restaurants, banks, bus stops, night spots, the local post office and more. We offer a selection of clean, comfortable and air-conditioned rooms to suit your needs. Two dorm style- 7beds (female) and 8beds (male) with air conditioning unit. Single Room with ensuite bathroom and air conditioning unit. Private Room will be king size bed/twin bedded room, ensuite bathroom with hot shower and with air-conditioned. Family Room come with one king size bed and bunk beds with air conditioning (shared bathroom). I only stayed at this place to crash overnight, but this surely looked like a great hostel for any backpacker. There is a nearby market that one might find interesting. So kind to check me in at 11AM, and the receptionist lady helped me to recover my forgotten phone too! Breakfast was great with toast + jam/magerine plus tea/coffee. There were few bathrooms and all of them were quite clean. Beds were comfy and had a proper working A/C too. Great and friendly staff, comfy rooms and amenities. Staff were very friendly & helpful. Highly recommended,esp. Single traveller. Thank you for making my stay a pleasant experience! Nice place with good accommodations and a great stop going across Sabah. Not much in the way of kitchen facilities besides a toaster and a sink, and there is virtually no communal space. However there are cool balconies that wrap the building. If you're a solo introverted traveler that likes to eat out, this place is perfect. I had stayed for two nights just to have a peace moment for my writing while spent a visit to Sabah Tea Garden. It was wonderful time met new friend. The staff was friendly and helpful. The room was clean and comfortable. Simple breakfast just nice. I would stay here again if I'm visit Ranau next time. Near to Kinabalu Park. Stayed here before climbing Mount Kinabalu. Great hostel, lovely staff! I stayed for 2 nights and really enjoyed this hostel, however as a solo traveller I do not recommend this area. I was the only person staying in the hostel and I did not see another tourist in the town. As all the attractions are a minibus away from Ranau, the prices were far too expensive for a single traveller. The locals try to rip you off and I would not go outside the hostel alone after dark as I felt very uncomfortable and unsafe. Could not wait to leave Ranau! Cheap hostel, you have to make your own bed but at least you know the bed is clean when you do that.